The Half Hawk is a new pattern in the Rough Rider Line. While Rough Rider calls the knife a Half Hawk, the main blade is actually a sheepfoot as the cutting edge has no curve to it whatsoever. Interestingly, Rough Rider has decided to team up the sheepfoot main with a somewhat robust spear secondary. 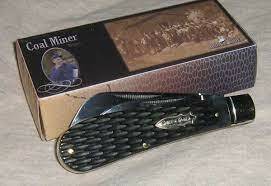 The frame of the knife is the same as the one used for their Hawkbill knife, however it lacks a lanyard hole. I suspect this is in part due to the new blade configuration. Currently the offerings include, Yellow Composition, Red Jigged Bone, Amber Jigged Bone, the Outdoorsman Series, and the Coal miner Series. Those familiar with Rough Rider will know the first four listed are probably the most popular among any of the Rough Rider Lines. 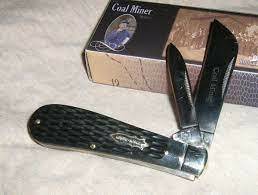 The Half Hawk, is only the eighth pattern released in the Coal Miner Series. The use of the sheepfoot blade allows the knife to have a much smaller blade profile than the hawkbill on the same frame. The addition of the spear secondary allows provides the user with a pointy blade should the need for poking objects comes about. Obviously, the addition of a second blade increased the width of the handle, however this is negligible. The knife features full brass liners and spacers so in chance of blade rub is completely avoided. The handles are well pinned and the overall fit and finish is exceptional. The knife has a nice walk and talk with an excellent closing snap. Both blades have a clean, positive half stop. The only thing really lacking is a lanyard or bail. This would have been a really nice feature on a knife of this style. (perhaps in future iterations!) 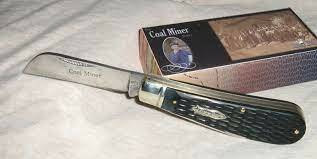 The Half Hawk is a worthy addition to Coal Miner Series. Hopefully they will release the Half Hawk in White Smooth Bone in the near future!